The Islander was cleared for a visual approach to runway 09 at Fort de France. It struck the side of Les Pitons du Cabbets, 15 feet below the summit of this 2795 feet high hill. CAUSES: "The accident was caused by the pilot's failure to identify the airdrome installations before the start of the night visual approach procedure under an IFR flight plan. 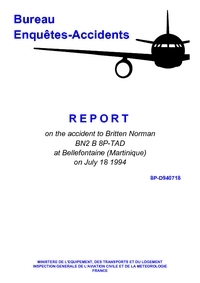 The probable failure of the onboard DME and the imprecise navigation contributed to the accident." Distance from Bridgetown-Grantley Adams International Airport to Fort de France-Lamentin Airport as the crow flies is 233 km (146 miles).